A black and white print of Ezekiel Richard Blow. Ezekiel Richard Blow was born at Whitby on February 6, 1860. As a young man he entered his father's coal and wood business at Port Whitby and took over the business when his father retired. He was also a ticket agent for the Canadian Pacific Railway (CPR). He was a member of the Whitby Town Council from 1893-1901, Mayor from 1903-1904 and 191, and Reeve from 1920-1924. He was Treasurer of Sussex Lodge No. 5, Sons of England for almost forty years. He died at Whitby on September 14, 1930 and is buried at St. John's Anglican Cemetery, Port Whitby. This picture is from a frame of portraits of members of Composite Lodge No. 30 AF & AM. 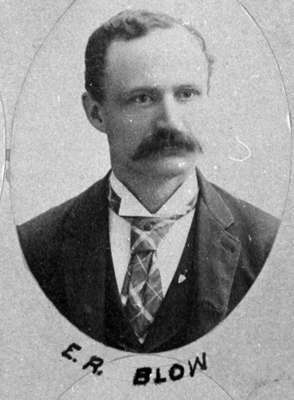 Ezekiel Richard Blow, 1892, W.E. O'Brien. Whitby Archives 31-002-052.